There are many ways to save energy on your new or existing home by taking advantage of the latest technology in alternative energies. Leading the trend are solar energy systems, which can be as small as adding a few solar panels to your roof or as extensive as a total solar home system depending on how much you want to rely on this free, natural resource to power you home's electricity and water. 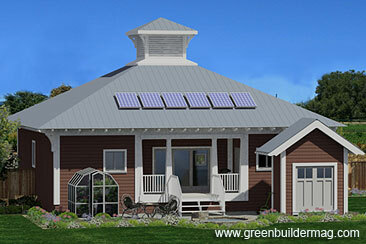 This new ENERGY STAR® approved home features photovoltaic and water heating panels on the roof. Everything about the Eco Box House Plan is energy-efficient, including the wind turbine generator. Don't be discouraged by the price, because there are many long term benefits and federal credits available to help absorb the initial cost of a solar energy system. The federal government offers substantial incentives for those looking to purchase an alternative energy system like a 30% credit off the total cost of any qualifying system for photovoltaic or water heating. Small wind turbines also qualify for this tax credit. DSIRE is a comprehensive source of information on state, local, utility and federal incentives that promote renewable energy and energy efficiency. You can also find information on 2011 Tax Credits for consumer energy efficiency at ENERGY STAR®, which expires on December 31, 2016 and at EnergyTaxRebate.com. Check with your local utility company and manufacturers who may also offer discounts. Picking the right solar system is very important and depends on your budget, size of your home and what you need the system to accomplish. You'll first need to decide if you want to use solar energy to power your entire home or just key areas? Or are you simply interested in just installing a solar water heating system? Another important consideration is how much space you have available for all the necessary components like the panels, battery backups and conversion system. The Park Place House Plan is all about providing homeowners with a highly efficient home that utilizes the latest technologies including solar panels. 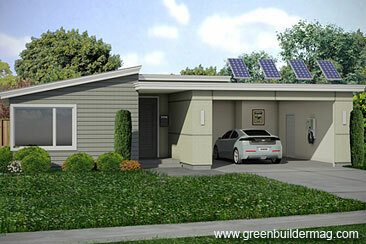 This new ENERGY STAR® home is available in 3D. To help you pick the right system for your needs it is recommended that you work with a solar expert. Typically the company that will install your system will offer a free consultation so you understand how to properly use your system. Be sure that you purchase a system that qualifies for all available tax credits. There are basically two kinds of residential solar energy you can choose from — solar thermal and photovoltaic. Solar thermal is the most common and is typically used to heat water and in some cases the entire home. Photovoltaic energy is used to provide electricity to your entire home. A solar water heater uses the heat from the sun to warm the water inside your home, which greatly reduces the amount of electricity you typically use with a traditional electric heater. For homes with a smaller footprint you can usually heat your entire home with thermal energy. A solar photovoltaic system can actually power your entire home and in some cases depending on where you live eliminate the need to be connected to your local power company. Of course the challenge with solar power is not the availability of this natural resource but how efficiently it converts to usable energy. Thanks to advances in technology solar panels are highly efficient, affordable and can last up to a decade before breaking down. You can purchase high-quality solar panels from manufacturers like GE®, SolarWorld® and Sharp®. If you have decided to use solar energy for your new home, you'll also want to consider energy efficiency when it comes to your lighting, major appliances, windows, roofing and insulation to create a truly green home. This will help to reduce your daily power usage and increase savings on your monthly electrical bills.